Today I’m working on one of Debra’s quilts for her Etsy shop. Libby over at The Quilted Craftsman pieced it. 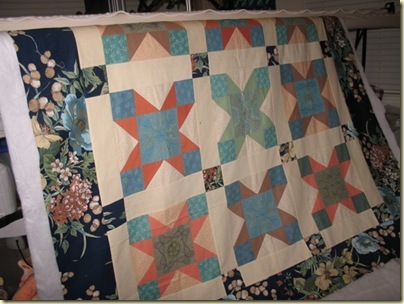 Barbara Brackman’s Encyclopedia of Pieced Quilt Patterns calls the pattern Austin. I’m wondering if there might be another name for it though. 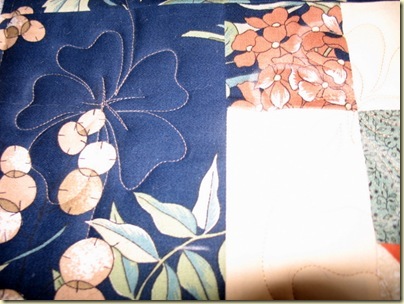 It is pieced in lovely colors with a cream background and dark blue floral cornerstones and border. Of course it has lovely embroidered patches in the center of each block. and a few butterflies on it. I hope that you have a great day doing something you love to do. I'm simply in awe of your quilting capability. These quilted butterflies and flowers are breathtaking! 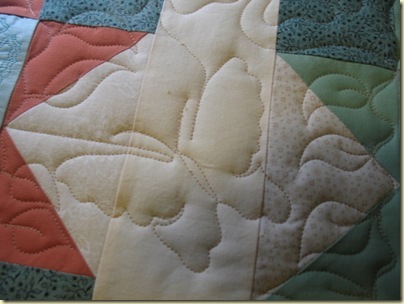 very soft and sweet quilt, and your quilting really makes it. 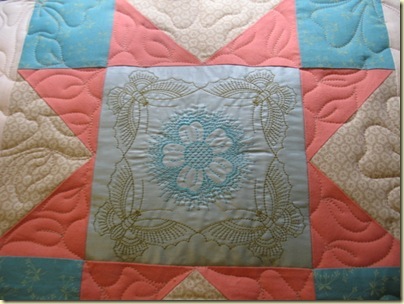 How wonderfully your quilting design complements the embroidery. The quilt is delightful. A really pretty and feminine quilt!